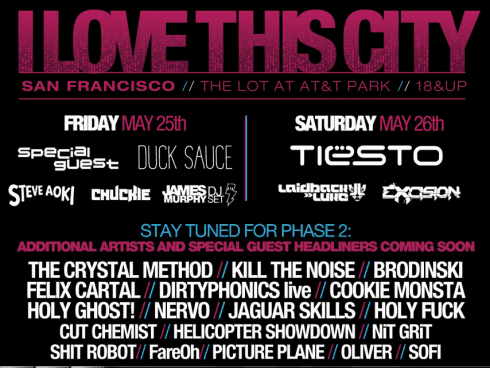 KSJS Electronic Ticketgiveaway For I LOVE THIS CITY SF! I Love This City SF! Friday’s lineup features performances by Afrojack, Sebastian Ingrosso, Duck Sauce, Steve Aoki, Chuckie, Datsik, James Murphy of LCD Soundsystem, AraabMuzik, Borgore, Brodinski, Claude VonStroke, Cookie Monsta, The Crystal Method, Cut Chemist, Dirtyphonics (live), FareOh, Holy Ghost!, Nervo, Oliver, Sh*t Robot, Sofi, Tenderlions, WhiteNoize and St. John. Saturday’s lineup includes Tiesto, David Guetta, Laidback Luke, Excision, Feed Me, Apparat, BT, Doctor P., Dyloot, Felix Cartal, Harvard Bass, Helicopter Showdown, Holy F*ck, Jaguar Skills, Kill The Noise, Madeon, Miles the DJ, NiT GriT, Picture Plane and Nick G.
KSJS Electronic Department will be giving away 2-Day passes for the festival. Tune in for your chances to win! Check out our page >>>>>>>>> KSJS Electronic for more information! CHECK OUT: http://www.facebook.com/events/265821350159883/ FOR UPDATED INFORMATION! few of the comments here KSJS Electronic Ticketgiveaway For I LOVE THIS CITY SF! or do some of the remarks look like they are left by brain dead folks? I’d like to follow you. Would you post a list of every one of your public pages like your Facebook page, twitter feed, or linkedin profile? previous post: Bassnectar At SJSU Event Center May 5th!